The museum complex is comprised of nine acres with three modern exhibition buildings and five historic structures. The Art Museum houses a permanent collection of American art and two changing exhibition galleries. The 40,000-square-foot Carriage Museum is home to the finest collection of American horse-drawn transportation artifacts in the world, most on permanent exhibition. The Visitors Center offers changing exhibitions as well as a permanent exhibition galleries devoted to Wildfowl Decoy Hunting on Long Island. Among the five historic structures on museum grounds are a one-room schoolhouse and a blacksmith shop, both used extensively in school programs. This structure was built by Frederick A. Smith in 1877 on Sheep Pasture Road, South Setauket, at the exact location of an earlier schoolhouse built in 1821. It served approximately thirty students annually, ranging from 5 to 15 years of age. 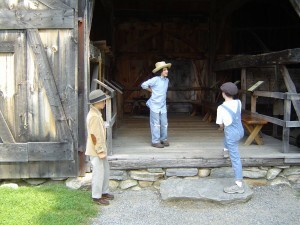 The children attended winter and summer terms leaving the spring and fall free for farm duties, a typical schedule of nineteenth-century schools in rural America. 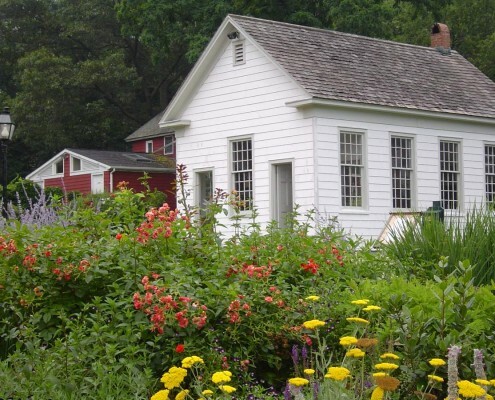 The schoolhouse was actively used until 1910 when Setauket school districts were consolidated into a single central school district and a new school was built in East Setauket. The building was eventually moved to The Museums at Stony Brook in 1956. The Nassakeag Schoolhouse’s architectural features provide an interesting glimpse into early American education principals. A double entry and foyer, with hooks for coats and a water pail and cup, emphasizes the standard separation of the sexes prevalent in the nineteenth-century. Museum educators conduct classes within this structure throughout the school year. Built in 1794 by Jedidiah Williamson, the Ploch-Williamson Barn is a significant structure to local and agricultural history. It originally stood on 30 acres of farm land in Stony Brook and was used as storage for tools, livestock and harvested crops. The barn was donated and moved to The Museums at Stony Brook in 1956. Although Williamson originally constructed a timber framed two-bay barn, when his needs increased he modified it into the larger and more traditional New England three-bay structure which now stands. The barn contains a wooden threshing floor, flanked by two dirt floored storage areas, called mows. It also contains special features that Williamson incorporated to provide for the comfort of his animals, including box stalls and a door providing access to the yard. The barn remained in the Williamson family for two generations and to a series of other owners prior to being donated to The Museums. Like the Nassakeag Schoolhouse, museum educators conduct programs throughout the school year for students within and around the barn. Although this building dates to 1834, it was completely reconstructed between 1875 and 1893 by Samuel H. West (1853-1938). West carried on several separate, yet interrelated trades within his shop: that of a farrier (horse-shoeing), a wheelwright (maker and repairer of wheels and wheeled vehicles), and finally, a blacksmith. West added a two-story wheelwright shop to the east end of the structure in addition to rebuilding the original blacksmith shop. He was able to keep his business swift and profitable until the 1920s, when the rise of the automobile and manufactured goods threatened and dramatically slowed the pace of his trades. 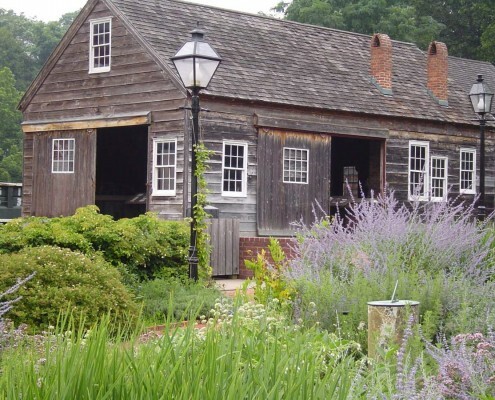 The Samuel H. West Blacksmith Shop was eventually acquired by and moved to The Museums at Stony Brook in 1952. The framing of the building is composed of mortise and tenon circular sawn timbers. Most of the original windows are still extant. The wheelwright shop was left behind when the rest of the structure moved to the Museum grounds and was subsequently demolished. The Museums have full text and artifacts on display for visitors to see (several of which can be traced to Samuel H. West) within the structure. 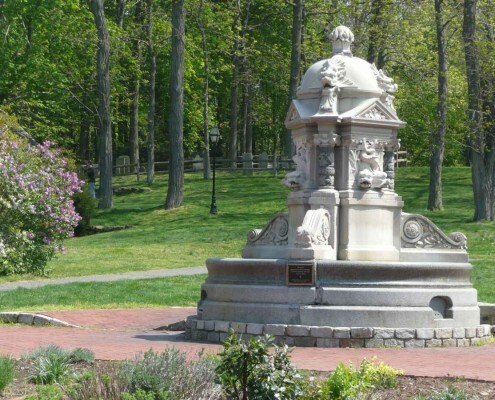 The fountain and horse trough was donated to New York City in 1880 by philanthropist Olivia Eggleston Phelps Stokes. A beautiful example of Beaux Arts stone and marble work, it was designed to provide drinking water for both people and horses. Erected at the busy intersection of Madison Avenue and 23rd Street, it reflected the spirit of improving treatment of animals. The fountain, rendered obsolete by the automobile, was dismantled in 1957 by New York City and subsequently removed to the Long Island Museum upon completion of the Carriage Museum in 1987. It was restored and stands at the head of the Herb Garden as a functioning fountain. 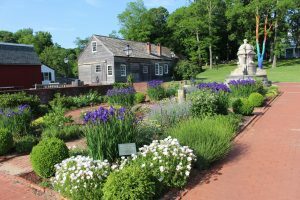 The Emma Lee Blackford Rockwell Herb Garden was installed on museum grounds in 1993. It is planted and maintained by the North Suffolk Garden Club. All plants in the garden are useful…nothing is planted just for its looks. Two of the beds contain medicinal plants and two contain edibles. Both are centered with roses because of their versatility. In addition to providing a beautiful setting for the museum’s buildings, the garden is used in many of our children’s programs to teach children about how plants were used before modern medicine was available. Gwen Marcus’s faux bronze The Tempest. In conceiving The Tempest, I sought to combine my interest in the human form in direct conflict with intense natural forces. 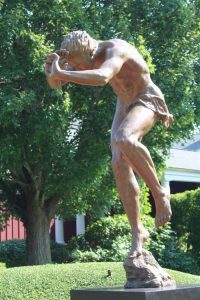 The Tempest places the powerful, idealized male figure in direct opposition to the forces of nature. His raised hands and expression convey the intensity of the struggle at the exact moment they meet. Sculpture@LIM is sponsored by Olivia & Harlan J. Fischer.